When it comes to attracting the ideal talent to work in your salon or spa, employee perks may sweeten the pot. In addition to a base salary plus any commission, consider these added perks. A 401(k) is a good way for your employees to save for retirement because the money grows tax-free. As the employer, it’s up to you to set the amounts for any employer contribution matching. However, the general contribution from an employer is usually three to six percent of an employee’s pay. For employees to receive a contribution from their employer, they (the employee) must contribute a specified percentage into the 401(k) plan. There’s also a limit on how much can be saved each year and when funds can be withdrawn. For 2018, the contribution limit is $18,500, but this amount is reassessed annually. Be sure to consult with your CPA to help set up a realistic contribution matching percentage and terms, and to be sure that you are complying with any laws on limits. In the United States, smaller businesses usually are not required to provide health insurance for their employees. However, having healthy, happy employees does make them more productive (i.e., fewer sick days, etc.). And, as a salon owner, you will likely need insurance for yourself and your family. It may be prudent to check into group health insurance plans through your local chamber of commerce or with trade organizations. Some insurance carriers do offer group plans for small businesses, so be sure to ask. That way your salon can provide accesses to a plan without costing an arm and a leg. Life insurance is another perk especially for anyone who is the primary breadwinner for the family. Much like health insurance, there are group plans available through industry and even local organizations that can offer an affordable option for your team. If your business is profitable, consider offering your employees profit sharing. A variable pay plan, profit sharing is where you assign a percentage of annual profits as an earmarked pool of money to share with your employees. Such a program sends the message that all of your employees have the same goals, are working together on the same team, and are rewarded equivalently for their dedication and service to customers. Payments for profit sharing are only made if your salon or spa has been profitable for a specific period, and are usually distributed at the end of the fiscal year. If your business suffers a loss and/or is not profitable for a given year, your employees will not receive a payment. Profit sharing requires adherence to strict guidelines and paperwork requirements. Discuss all options, requirements, and percentages with your CPA before implementing such a program. 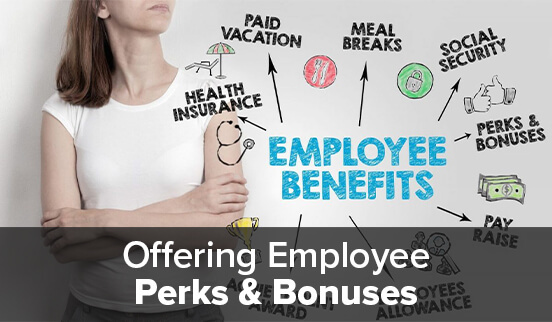 Another employee perk is offering bonuses. Such programs involve compensation for work performed in addition to salary, wages or commissions. Bonuses can be for a specific period, project or event and are done solely at the discretion of the employer.